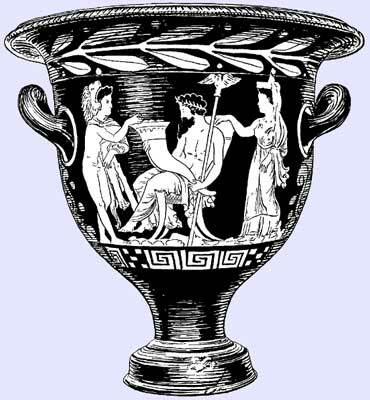 Heracles in the Olymp taking fruit from the Cornucopia. In April 2005, the World Food Programme and the Chinese government jointly announced that food aid shipments to China would stop at the end of the year. For a country where a generation ago hundreds of millions of people were chronically hungry, this was a landmark achievement. Not only has China ended its dependence on food aid, but almost overnight it has become the world's third largest food aid donor.The key to China's success was the economic reforms in 1978 that dismantled its system of agricultural collectives, known as production teams, and replaced them with family farms. In each village, the land was allocated among families, giving them long-term leases on their piece of land. The move harnessed the energy and ingenuity of China's rural population, raising the grain harvest by half from 1977 to 1986. With its fast-expanding economy raising incomes, with population growth slowing, and with the grain harvest climbing, China eradicated most of its hunger in less than a decade—in fact, it eradicated more hunger in a shorter period of time than any country in history. As we note at Earth Policy Institute, while hunger has been disappearing in China, it has been spreading throughout much of the developing world, notably sub-Saharan Africa and parts of the Indian subcontinent. As a result, the number of people in developing countries who are hungry has increased from a recent historical low of 800 million in 1996 to over 1 billion today. Part of this recent rise can be attributed to higher food prices and the global economic crisis. In the absence of strong leadership, the number of hungry people in the world will rise even further, with children suffering the most. Dealing with this problem requires addressing the long-term trends leading to growth in demand for food outpacing growth in supply. One key to the threefold expansion in the world grain harvest since 1950 was the rapid adoption in some developing countries of high-yielding wheats and rices (originally developed in Japan) and hybrid corn (from the United States). The spread of these highly productive seeds, combined with a tripling of irrigated area and an 11-fold increase in world fertilizer use, tripled the world grain harvest. Growth in irrigation and fertilizer use essentially removed soil moisture and nutrient constraints on much of the world's cropland. Now the outlook is changing. Farmers are faced with shrinking supplies of irrigation water, a diminishing response to additional fertilizer use, rising temperatures from global warming, the loss of cropland to non-farm uses, rising fuel costs, and a dwindling backlog of yield-raising technologies. At the same time, they also face fast-growing demand for farm products from the annual addition of 79 million people a year, the desire of some 3 billion people to consume more livestock products, and the millions of motorists turning to crop-based fuels to supplement tightening supplies of gasoline and diesel fuel. Farmers and agronomists are now being thoroughly challenged. The shrinking backlog of unused agricultural technology and the associated loss of momentum in raising cropland productivity are found worldwide. Between 1950 and 1990, world grain yield per hectare climbed by 2.1 percent a year, ensuring rapid growth in the world grain harvest. From 1990 to 2008, however, it rose only 1.3 percent annually. This is partly because the yield response to the additional application of fertilizer is diminishing and partly because irrigation water is limited. This calls for fresh thinking on how to raise cropland productivity. One way is to breed crops that are more tolerant of drought and cold. U.S. corn breeders have developed corn varieties that are more drought-tolerant, enabling corn production to move westward into Kansas, Nebraska, and South Dakota. Kansas, the leading U.S. wheat-producing state, has used a combination of drought-resistant varieties in some areas and irrigation in others to expand corn planting to where the state now produces more corn than wheat. Another way of raising land productivity, where soil moisture permits, is to increase the area of multicropped land that produces more than one crop per year. Indeed, the tripling in the world grain harvest since 1950 is due in part to impressive increases in multiple cropping in Asia. Some of the more common combinations are wheat and corn in northern China, wheat and rice in northern India, and the double or triple cropping of rice in southern China and southern India. The spread in double cropping of winter wheat and corn on the North China Plain helped boost China's grain production to where it rivaled that of the United States. Winter wheat grown there yields 5 tons per hectare. Corn also averages 5 tons. Together these two crops, grown in rotation, can yield 10 tons per hectare per year. China's double cropped rice annually yields 8 tons per hectare. Forty years ago, North India produced only wheat, but with the advent of the earlier maturing high-yielding wheats and rices, wheat could be harvested in time to plant rice. This wheat/rice combination is now widely used throughout the Punjab, Haryana, and parts of Uttar Pradesh. This practice yields a combined 5 tons of grain per hectare, helping to feed India's 1.2 billion people. A concerted U.S. effort to both breed earlier maturing varieties and develop cultural practices that would facilitate multiple cropping could substantially boost crop output. If China's farmers can extensively double crop wheat and corn, then U.S. farmers could do the same if agricultural research and farm policy were reoriented to support it. Elsewhere, Western Europe, with its mild winters and high-yielding winter wheat, might also be able to double crop more with a summer grain, such as corn, or with a winter oilseed crop. Brazil and Argentina have an extended frost-free growing season that supports extensive multicropping, often wheat or corn with soybeans. In many countries, including the United States, most of those in Western Europe, and Japan, fertilizer use has reached a level where using more has little effect on crop yields. There are still some places, however, such as most of Africa, where additional fertilizer would help boost yields. Unfortunately, sub-Saharan Africa lacks the infrastructure to transport fertilizer economically to the villages where it is needed. As a result of nutrient depletion, grain yields in much of sub-Saharan Africa are stagnating. One encouraging response to this situation in Africa is the simultaneous planting of grain and leguminous trees. At first the trees grow slowly, permitting the grain crop to mature and be harvested; then the saplings grow quickly to several feet in height, dropping leaves that provide nitrogen and organic matter, both sorely needed in African soils. The wood is then cut and used for fuel. This simple, locally adapted technology, developed by scientists at the International Centre for Research in Agroforestry in Nairobi, has enabled farmers to double their grain yields within a matter of years as soil fertility builds. Despite local advances, the overall loss of momentum in expanding food production is unmistakable. It will force us to think more seriously about stabilizing population, moving down the food chain, and using the existing harvest more productively. Achieving an acceptable worldwide balance between food and people may now depend on stabilizing population as soon as possible, reducing the unhealthily high consumption of animal products among the affluent, and restricting the conversion of food crops to automotive fuels. It also calls for a concerted effort to raise water use productivity, similar to the gains achieved for land use, and to stabilize climate to avoid crop-withering temperatures and more frequent droughts. These efforts combined can help put us on the path to ensuring enough food for all. For more on this subject, see Chapter 9, "Feeding Eight Billion Well," in Lester R. Brown, Plan B 3.0: Mobilizing to Save Civilization, available for free downloading. Read more about Raising water productivity. Read more about stabilizing climate.